Radia—a network of 20 radio stations in 13 countries—devoted show 731 to the music of Jason Cady featuring The Sounds of San Donato: Radio Symphony Orchestra, and excerpts from Candy Corn and The Captives. The episode was produced by Radio Papesse. The Sounds of San Donato: Radio Symphony Orchestra, a work for flute, cello, guitar, drum-set, and multi-channel audio transmitted live to 42 radios premieres February 22, 2019 at Piazza San Donato, spazio XL, Florence Italy, at 18:00, produced by Radio Papesse. Candy Corn is reviewed in The Wire, January, 2008, and I Care If You Listen, November 20, 2018, and Theater Scene, December 7, 2018. Jason Cady performs keyboards with Dan Joseph and Tom Chiu at Sunday Soundscapes at Troost, Brooklyn NY, January 20, 2019, 8:00 PM. Jason Cady is interviewed by I Care If You Listen, December 19, 2018, and by Hoc Tok. WGXC 90.7-FM’s Saturday Night Special will play Candy Corn and Buick City, 1:00 AM in its entirety, December 15, 2018. 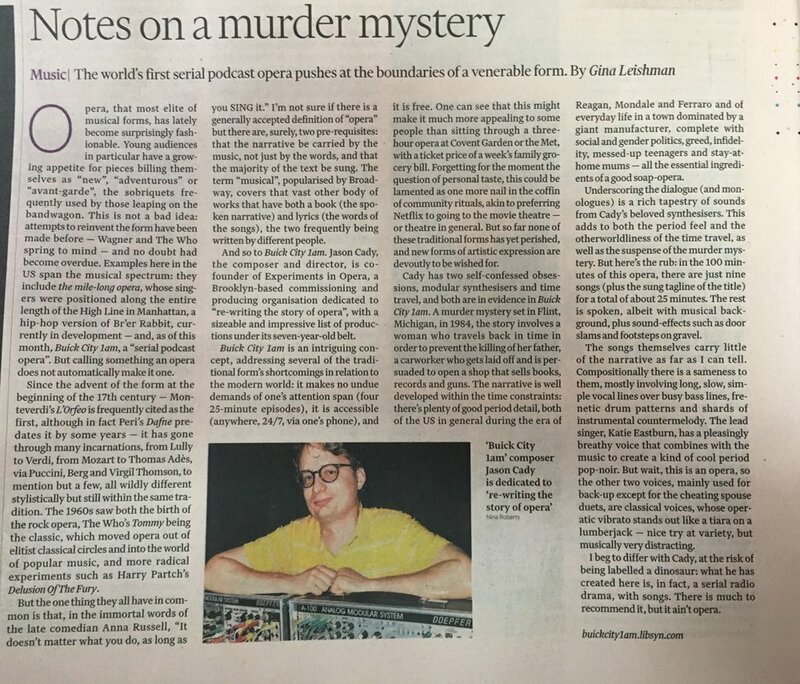 Buick City, 1:00 AM is reviewed in The Financial Times, November 30, 1018; The Bello Collective Newsletter, November 14, 2018; Schmopera, October 24, 2018, My City, December 23, 2018. Jason Cady is a guest on Carl Schoonover’s “Cereal Music” on WKCR 89.9 FM on November 20, 2018 from 10:00-12:00 PM. Jason Cady performs keyboards with Dan Joseph and Tom Chiu at Sunday Soundscapes at Troost, Brooklyn NY, November 18, 2018, 8:00 PM. Buick City, 1:00 AM, a 4-episode serial opera, premieres November 6, 2018 on Apple Podcasts, Spotify, Stitcher or wherever you listen to podcasts. It’s a mystery about a woman traveling back in time to 1984 to prevent the murder of her father, an auto-worker in Flint, Michigan. Candy Corn premieres in “Modularias” a performance of music for voice and modular synthesizer at The Flea Theater, New York City, November 2-3, 2018, alongside works by Kamala Sankaram, Joan La Barabara, and Andrew Raffo Dewar. See previews in The New Yorker, Opera Wire, The Wire Magazine, and Schmopera. Jason Cady is interviewed with Aaron Siegel and Matthew Welch by Schmopera, October 22, 2017. 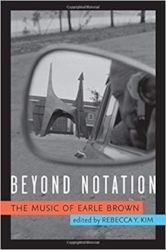 "An Overview of Earle Brown's Techniques and Media" by Jason Cady is a featured chapter in Beyond Notation: The Music of Earle Brown, edited by Rebecca Kim, published by University of Michigan Press. An excerpt from The Voices in My Head will be performed at Dillon + Lee Gallery, New York City, September 9, 2017. Reviews of The Voices in My Head in The Theater Times , New York Classical Review, I Care if You Listen, and Seen and Heard International. The Voices in My Head premiers in “Flash Operas” at Symphony Space, New York City, May 5 & 6, 2017, along works by Miguel Frasconi, Cristina Lord, Matthew Welch, Aaron Siegel and Nicole Murphy in a fully stage production directed by Rob Reese with set design by Casey Alexander Smith and costumes by Fay Leshner. Jason Cady will play pedal steel in a performance of Terry Riley's In C at (Le) Poisson Rouge February 27, 2017 with Greg Fox, Eli Spindel, Jeanann Dara, Pauline Kim Harris, Conrad Harris, Justin Kantor, David Handler, Laura Ortman, Dana Lyn, MV Carbon, Ha Yang Kim, David Grubbs, Elliott Sharp, Zach Layton, James Ilgenfritz, Evan Rapport, Sam Kulik, Peter Gordon, Ben Neil, Peter Kotik, Josh Rubin, Peter Hess, Peter Zummo, Daisy Press, Nick Hallett, Katie Eastburn, Arooj Aftab, Gabrielle Herbst, Emily Manzo, Matt Mottel, Bradford Reed, Mia Theodoratus, and Michael Century. All proceeds will benefit The New York Immigration Coalition. An excerpt from The Captives is featured on Notes from Sub Underground: A Compilation of Music, Sound, and Aural Ephemera in Protest of Inauguration Day. 100% of the proceeds go to the ACLU. A newly revised version of I Need Space premiers at Merkin Concert Hall, New York City, 7:30pm, December 15, 2016 alongside works by Roddy Bottum, Lainie Fefferman, Matthew Welch, and Nick Hallett. Jason Cady and Experiments in Opera are featured in The New Yorker magazine's Talk of the Town. Nostalgia Kills You will be performed at The Stone, New York City, July 28, 2016, alongside works by Jessica Pavone, Sasha Zamler-Carhart, Matthew Welch and Aaron Siegel, featuring Tomas Cruz, Erin Flannery, Brian Chase, Shawn Lovato, Emily Manzo and the Ghostlight Chorus conducted by David Bloom. Jason Cady performs in Shimmer, a new composition for 16 cymbals by Brian Chase (of the Yeah Yeah Yeahs) June 21, 2016 at 3:30 in Madison Square Park, New York City. This event is part of Make Music New York. WQXR's Operavore reviewed I Screwed Up the Future. Anthony Tommasini reviewed I Screwed Up the Future in The New York Times. Jason Cady is featured in a round table discussion on propaganda in music in issue 15 of Sound American with Nate Wooley, Ian Nagasoki, Aaron Siegel, Matthew Welch, and Katherine Young. I Screwed Up the Future, a new opera for video by Jason Cady and Malik Isasis, staring Katie Eastburn, Sasha Zamler-Carhart, and Tomas Cruz, premieres at Anthology Film Archives May 6 and 7, 2016, along with video operas by Emily Manzo, Dorian Wallace, Aaron Siegel and Anna Mikhailova. Jason Cady will play pedal steel in a performance of Terry Riley's In C at (Le) Poisson Rouge February 3, 2016 with Ben Neill, David Grubbs, Alex Mincek, Petr Kotik, Eli Spindel, Joshua Rubin, Jonathan Kane, Ben Vida, Daisy Press, Laura Ortman, Evan Rapport, Christopher McIntyre, Matt Mottel, Jeanann Dara, Jessica Pavone, Megan Schubert, Josh Modney, Peter Gordon, Jen Baker, Peri Mauer, Peter Hess, Justin Kantor, Zach Layton, Jen Baker, Nick Hallett, Joe Drew, and Bradford Reed. Jason Cady is interviewed with Aaron Siegel and Matthew Welch by George Grella on The Brooklyn Rail's podcast Rail Tracks. The interview begins at 43:45. The Free Sound Ahn-somble premieres Not In The Mood, a new work for 16 piece big band at The Actors Temple Theater in New York City on November 10, 2015. Theater Scene and Parterre reviewed Cut Up with Catcher in The Rye. A new work will be premiered by the Anagram Ensemble at The Stone in New York City, October 16, 2015 alongside works by Natacha Diels, Anne Guthrie, James Ilgenfritz, Travis Just, Lukas Ligeti, Charlie Looker, Elliott Sharp, Aaron Siegel, JG Thirlwell, and Katie Young. The Captives, a new narrative song cycle will be performed at Roulette in New York City, April 2, 2015 alongside works by Gelsey Bell, Aaron Siegel and Roddy Bottom. Sisyphus is reviewed in New York Classical Review, Stage Buddy, and The New Criterion. Sisyphus, a new opera composed in collaboration with Aaron Siegel and Matthew Welch will be performed at Abrons Art Center in New York City, February 13, 14, 20, and 21, 2015 in a fully staged production directed by Ethan Heard. How to Form Non-Sequiturs a new piece for 16-piece big band premieres Saturday, February 7, 2015 at The Cell Theater in Manhattan, performed by Dorian Wallace's Free Sound Ahn-somble. Happiness is the Problem is reviewed in The Squid's Ear. Dead Inside a new video short made with Christine Edwards premieres at Abrons Art Center on May 3-4, 2014 at 8:00 pm. I Need Space premieres on Q2 on March 21, 2014 at 8:00 pm EST, and will be available for streaming indefinitely on their website. It will be broadcast on Saturday, April 12, 2014 8:00 pm on WGXC. Experiments in Opera curated a play list for Q2 the online new music branch of WQXR. It broadcasts at 3:00 pm EST on March 12, 2014, and will be available for streaming indefinitely on their website. The Wall Street Journal writes about I Need Space. I Need Space, a radio opera, premieres February 28 and March 1, 2014 at Abrons Arts Center in New York City alongside works by John King, Jonathan Mitchell, Paul Pinto, Aaron Siegel and Matthew Welch. Jason Cady performs In C with Joan La Barbara, Elliot Sharp, So Percussion, Emily Manzo, Jessica Pavone, Aaron Seigel, et al at Issue Project Room 8:00 PM, December 5, 2014. Huffington Post talks about Experiments in Opera. Nostalgia Kills You is reviewed in The New York Times. Jason Cady is interviewed with Aaron Siegel and Matthew Welch on The 5049 Podcast with Jeremiah Cymerman. Nostalgia Kills You, a one act opera for baritone, soprano and chorus premieres November 2, 2013 at Abrons Arts Center in New York City along with works by John Zorn, Jessica Pavone, and Matthew Welch. Love & Noise in Buick City, is part of the Empire Drive-In Installation at the New York Hall of Science from October 4-20, 2013. Happiness is the Problem is reviewed in I Care If You Listen. Jason Cady will perform The Mother and other works at The Old Stone House in Brooklyn, NY as part of Dan Joseph's Musical Ecologies series on May 16, 2013 at 8:00 pm. New Music Box reviewed the premier of The Mother at Issue Project Room on February 9, 2013. The Flame Alphabet, a radio documentary about the novel of that title by Ben Marcus with music composed by Jason Cady and production by Ann Heppermann aired nationally March 8-9, 2013 on IPR's Studio 360. The Mother, a new opera short by Jason Cady will be premiered at Issue Project Room, at their temporary location at The Actors Fund Arts Center, 160 Schermerhorn St. Brooklyn, NY on February 9, 2013. It will be performed by Hotel Elefant with Erin Flannery and Lisa Komara. It is part of Experiments in Opera's "New Shorts" program, which also includes premiers by Robert Ashley, Joe Diebes, Ruby Fulton, Gabrrielle Herbst, Mary Kouyoumdjian, Aaron Siegel, Justin Tierney, Leaha Maria Villarreal, and Matthew Welch. Jason Cady will present a paper he wrote on Earle Brown at Beyond Notation: An Earle Brown Symposium, at Northeastern University in Boston, MA on January 19, 2013. Happiness is the Problem has been released on Lockstep Records as a CD and digital download. It can be purchased from Amazon, itunes, CD Baby, and directly from Lockstep. Jason Cady performs two new works with Erin Flannery and Amelia Watkins (sopranos), Lisa Komara (mezzo-soprano) and Tim Dahl (bass guitar) at Spectrum on December 2, 2012 from 5:00-7:00 pm, as part of a benefit for Experiments in Opera and in celebration of the release of Happiness is the Problem on CD from Lockstep records. Other performers include Matt Welch, Aaron Siegel, members of Hotel Elefant, and John Zorn. Imaginary Friends Forever, a radio documentary by Jessica Benko with music composed by Jason Cady and production by Ann Heppermann aired nationally November 24-25, 2012 on IPR's Studio 360.
Review of the Experiments in Opera Spring Series at Roulette featuring Jason Cady's opera, Happiness is the Problem, on WQXR's Operavore May 14, 2012. Article about Experiments in Opera featuring Jason Cady, in the Huffington Post May 9, 2012. Article about Experiments in Opera featuring Jason Cady, in Feast of Music May 9, 2012. Article about Experiments in Opera featuring Jason Cady, in Classical TV May 8, 2012. Interview with Jason Cady, Matt Welch, Aaron Siegel, Lynn Levy and Dave Ruder in I Care If You Listen May 3, 2012. Interview with Jason Cady and Aaron Siegel in the Roulette Blog May 8, 2012. Jason Cady and Aaron Siegel appeared as guests on the Indie Opera Podcast on April 27, 2012. Happiness is the Problem is being performed at Roulette in Brooklyn, New York on May 10, 2012 at 8:00 pm, along with Aaron Siegel's Brother Brother, and a work by Cough Button a.k.a. Aliza Simons, Dave Ruder, and Lynn Levy. TRANSIT is performing Three Quintets at the Alaska Native Heritage Center in Anchorage, Alaska on March 3, 2012. Jason Cady will be a guest on WPIR's The Rodent Hour on February 21, 2012 from 8:00-9:00 pm EST. Chorus of Refuge is featured on How Sound: The Backstory to Great Radio Storytelling including an interview with Jason Cady and Ann Heppermann. Jason Cady will be a guest on East Village Radio's Andrew Andrew Sound Sound Friday, January 13 from 10:15 - 10:45 am EST. Steve Smith in Time Out NY describes Happiness is the Problem as "bubbly and brainy..."
The first act of Happiness is the Problem will be performed at le Poisson Rouge on January 16, 2012 at 7:30 PM as part of the Experiments in Opera festival. Excerpts from these other operas will also be performed: Sextour: l'origine des especes by Georges Aperghis; Borges and the Other by Matt Welch; and Brother Brother by Aaron Siegel. Jason Cady interviews composer Matt Welch for Antilogy Magazine. Chorus of Refuge is featured in this new book, Transmission Arts: Artists & Airwaves, by Galen Josef-Hunter with Penny Duff and Maria Papadomanolaki. Check it out on Amazon. Transit performs Three Quintets at 8:00 PM, Saturday, May 28, 2011 at Tenri Cultural Institute in New York City. Jason Cady is featured on NPR's "The Mix: 100 composers under 40." Article on Jason Cady in the April 2011 issue of Java Magazine. Review of Chorus of Refuge installation at ArtSpaceWest on the campus of Arizona State University West in The State Press. Chorus of Refuge will be installed at ArtSpaceWest on the campus of Arizona State University West from February 22 to March 4, 2011. The opening is February 22 at 6:30 PM. TRANSIT recorded Three Quintets which is now available on CD in a small edition with hand painted covers. The CD also includes music by Daniel Wohl and Sean Friar. You can purchase a copy directly from TRANSIT here. Erin Flannery, soprano; Emily Manzo, piano; Al Cerulo, vibraphone; and Jason Cady, synthesizer perform Odi Et Amo, plus a preview of some new compositions on December 8, 2010 at University of the Streets in New York City as part of a series curated by Sam Kulik. Matt Bauder (clarinet), Jason Cady (keyboard), Isabel Castelvi, (violin), Natacha Diels (flute), Luke Dubois (visuals), Cornelius Dufalo (violin), Shannon Fields (glockenspiel), Lesley Flanigan (voice), Erin Flannery (voice), Miguel Frasconi (synthesizer), Jon Gibson (saxophone), Peter Gordon (saxophone), Gisburg (voice), David Grubbs (guitar), Nick Hallett (voice), Tom Hamilton (synthesizer), Jonathan Kane (drums), Ha-Yang Kim (cello), Sam Kulik (trombone), Zach Layton (bass), Emily Manzo (piano), Jacqueline Martelle (flute/piccolo), Shahin Motia (guitar), Matt Mottel (organ), Dafna Naphtali (voice), Ben Neil (trumpet), Andrea Parkins (electric accordion), Jessica Pavone (viola), Kathleen Supove (piano), Ray Sweeten (oscillographics), Hans Tammen (guitar), Alexander Waterman (cello), Nathan Wooley (trumpet), Peter Zummo (trombone) perform Terry Riley's In C on November 16, 2010 at 7:00 PM at Le Poisson Rouge in New York City for a benefit concert for the "Darmstadt Classics of the Avant Garde" Essential Repertoire festival. Transit performs Three Quintets on June 19, 2010 at 7:00 PM at Tenri Cultural Institute in New York City for a benefit concert for the American Cancer Society in memory of Simeona Bergen. Transit premieres Three Quintets on March 20, 2010 at Tenri Cultural Institute in New York City. Jason Cady performs in John Cage's Four (3) with the Lyon Opera Ballet at The Joyce Theater in New York City from March 9 through March 14, 2010. Chorus of Refuge is featured in the first issue of The [UN]OBSERVED, a Radio Magaizine.